This recipe has a lot to recommend it: salty, sweet, sour, bitter and umami. Crunchy peanuts and crisp cucumbers accent the rich smoothness (like panna cotta or custard) of Hodo Soy fresh tofu. To highlight the tofu’s delicate texture we leave it in one large piece per serving and cook it over a gentle heat for only 2 minutes, just to accept the soy glaze. Make the cucumber salad (recipe follows) first. Have all your ingredients ready before you start as the cooking takes only a few minutes and you don’t want to blacken the garlic and sesame seeds. Drain the tofu on paper towels and cut into 4 large triangles. Coat the bottom of a cold non-stick fry pan with the oil. Distribute the garlic, sesame seeds, peanuts and chili flakes in the pan and place over a medium heat. Heat until the garlic is fragrant and the sesames turn golden (2-3 minutes). Add the wine, soy sauce and sugar to the pan, let cook 30 seconds. Push the peanuts to one side of the pan, set the tofu on top of the glaze and don’t move the pieces for 1 minute. When the tofu is nicely browned, turn over and remove the pan from the heat. Let cool in the pan. Divide the greens and cilantro between 4 salad plates, add a mound of cucumber salad and spoon a little of the cucumber marinade over the greens. 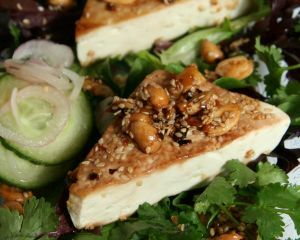 On ach plate place a triangle of tofu and top with the peanuts and sesames. Combine the vinegar, lime juice, sugar and salt in a medium bowl. Add the shallots, sliced as thinly as you can. Add the chili finely minced. Stir in the cilantro. Add the cucumber, sliced as thinly as you can. Let rest at least 15 minutes before serving. Can be made several hours ahead. For more information about Hodo Soy products see article above.